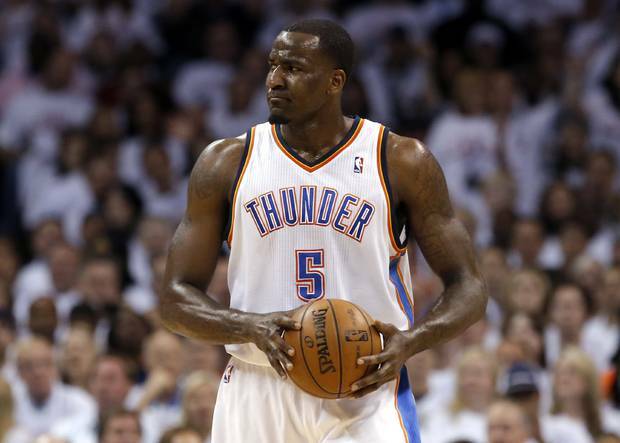 During Sam Presti’s “opening of training camp” press conference last week, he mentioned that starting center Kendrick Perkins would be out for the entire preseason, recovering from the 2 offseason surgeries he had on his groin and wrist. Being that Perkins is a 10 year veteran and a consummate professional, I am not at all worried about his conditioning, or whether he’ll be ready to play once the season starts. As an aside, can you believe that Perkins has already been in the league a full decade? But, in a way, I’m ecstatic that our younger centers now have a chance to prove themselves in some real game action before the season begins. Oklahoma City’s trainer Joe Sharp and his medical staff have done a great job of keeping the Thunder players healthy, for the most part. And to their credit, the players’ quick healing and sheer stubbornness have also played a part in them hardly missing any games. With that said, I’ve always wondered how Eric Maynor would fare as the starting point guard for the Thunder in a couple games. We all know how he performed in the 4th quarter of Game 2 of the Western Conference Finals in the 2011 playoffs. Was that an aberration or was it really how Maynor would perform with top notch talent consistently around him? Not that I necessarily want to see Maynor as a starter for an extended period of time, but if Russell Westbrook were to sit out a game or two in the preseason, I wouldn’t mind at all. In fact, I would welcome it. The biggest detriment to a young player’s development is lack of playing time. 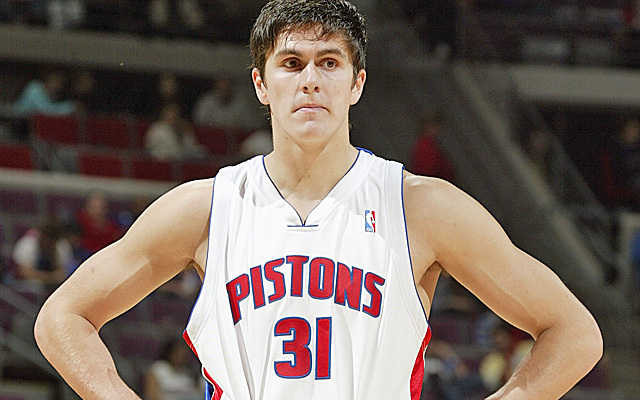 Would Darko Milicic be a better player today had he played for a lottery bound team that immediately needed him to develop, instead of being the human victory cigar for the Eastern Conference runners-up Detroit Pistons? We will never know that answer, but it serves as a cautionary tale in how teams handle their young players’ minutes. In the case of the Pistons, there just wasn’t enough room on the team for Milicic to develop on the floor. With Mehmet Okur, Ben Wallace, Tayshaun Prince, Rasheed Wallace, and Antonio McDyess manning the front line for Detroit at different times during a 5 year championship window, there simply wasn’t enough minutes in a game to help develop a young center while still contending. 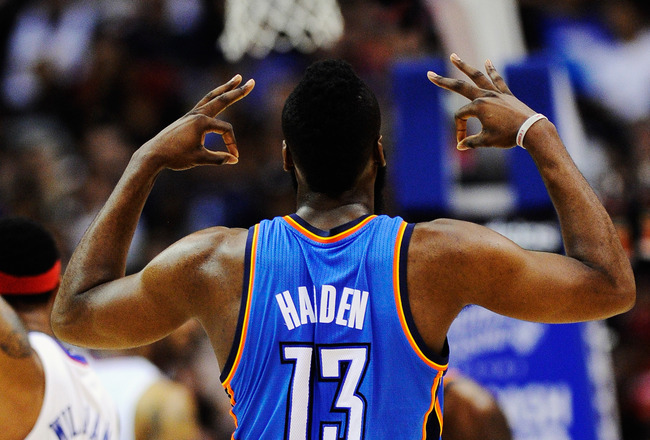 Which brings us to the three young centers on the Thunder’s preseason roster. 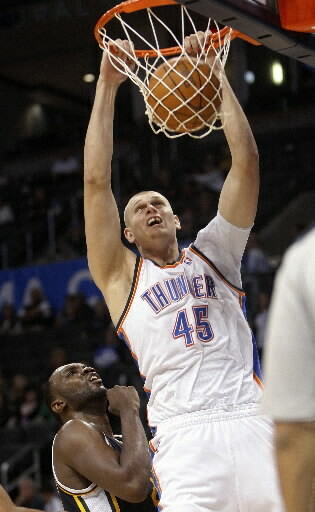 Cole Aldrich, Hasheem Thabeet, and Daniel Orton are all trying to find their spots in the NBA. Three different stories that lead to the same two things: playing time and development. Aldrich would seem to hold the upper hand amongst the 3 centers, as he has been with the organization the longest. 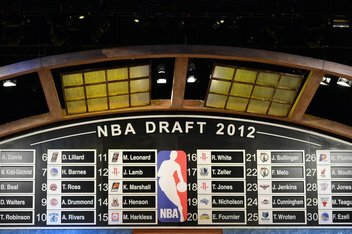 The 11th overall selection in the 2010 NBA draft, Aldrich has been entrenched as the team’s 3rd center behind Perkins and Nazr Mohammed. He’s shown enough in D-League stints and garbage time to keep the team intrigued with his defensive potential. With Mohammed’s departure to the Chicago Bulls in the offseason, the back-up center position is his to lose. Sometimes, an opportunity presents itself that you just have to try out. 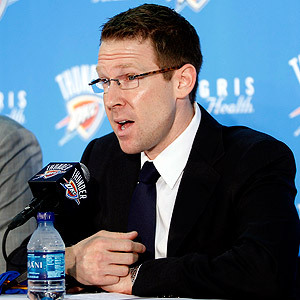 Sam Presti has always been intrigued by Hasheem Thabeet, going all the way back to the 2009 NBA draft. Thabeet was off the board by the time the Thunder selected James Harden with the 3rd pick, but Presti kept close tabs on him after that. There were always rumors of OKC trying to obtain Thabeet during the trading deadline. 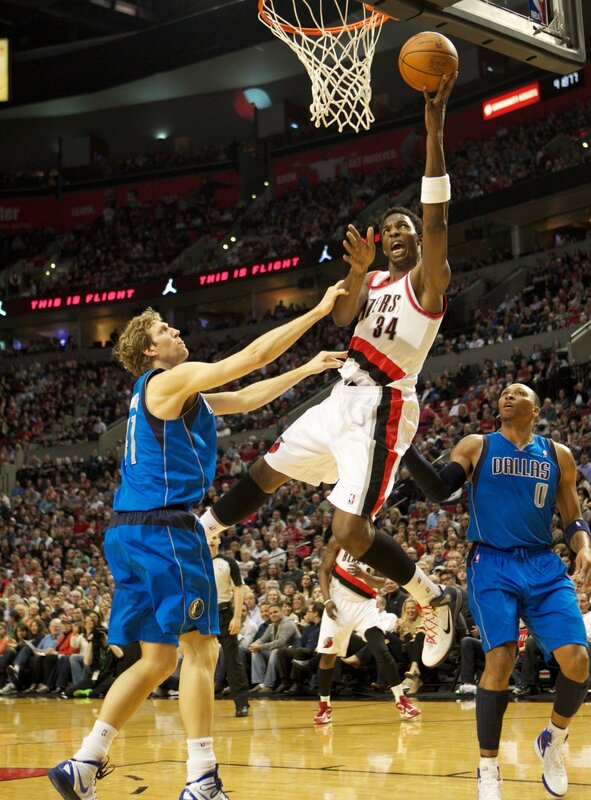 After 3 disappointing seasons, in which Thabeet had stints on three NBA teams and two D-League teams, the Portland Trailblazers decided not to pick up his 4th year option, thus allowing him to become an unrestricted free agent going into this offseason. Seeing the potential for a low risk, high reward player, Presti signed him to a 2 year, vet-minimum contract. The center, who is pretty mobile, despite being the tallest player in the league (7’3”), has the potential to be a disruptive force on the defensive end. 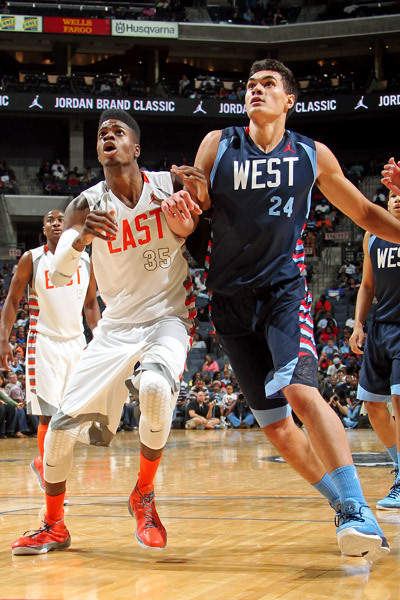 The question is whether he can put all his physical attributes and talent together to be an effective NBA player. Sometimes injuries play a part in negating a young player’s time on the court. Daniel Orton was drafted in the same year as Aldrich by the Orlando Magic as a possible back-up to Dwight Howard. After suffering a torn ACL during his senior season in high school, Orton once again suffered a season ending knee injury during his rookie season while in the D-League. After recovering in the 2010-11 season, Orton finally saw some game action in the 2011-12 season. The Magic decided not to pick up his 3rd year option, thus allowing him to enter unrestricted free agency. 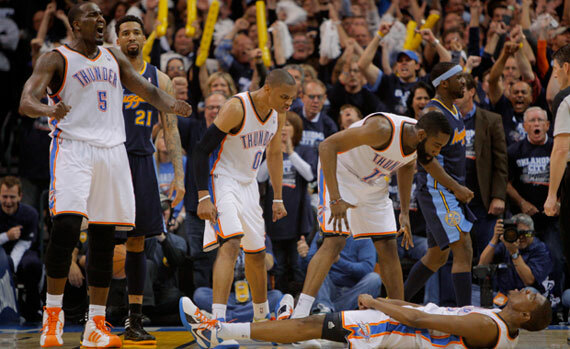 The Thunder decided to bring Orton in as a training camp invite to see how he fits into their system. He probably has the most untapped potential out of the 3 young centers on the team. Rumor has it that if the Thunder don’t sign Orton to a contract, they may try to keep him in their system through the Tulsa 66ers, their D-League affiliate. The preseason will be a great opportunity for these three young players to show what they got. 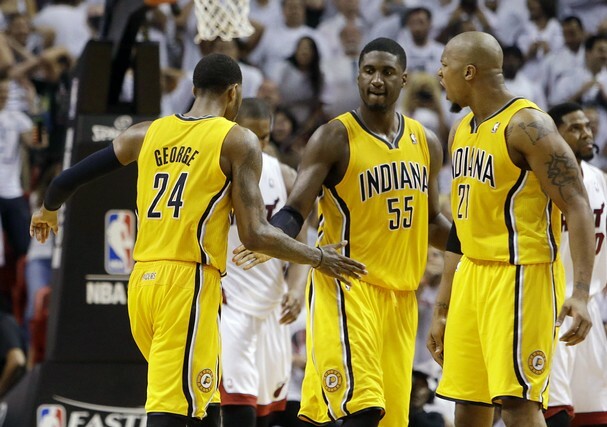 It may actually be their last chance to prove they are NBA-caliber players. The NBA is a league of “what have you done for me lately?” If a player hasn’t shown anything in his allotted time in the league, you can bet there is another player somewhere looking to seize the day and take that spot.